Take the guesswork out of grain-free baking with our Paleo Baking Flour! They've created this unique blend of nut flour and root starches to make the perfect ingredient for grain-free baking. Their Paleo Baking Flour is a unique blend of nut flours and root starches, combined in the perfect proportions for easy grain-free baking and cooking. 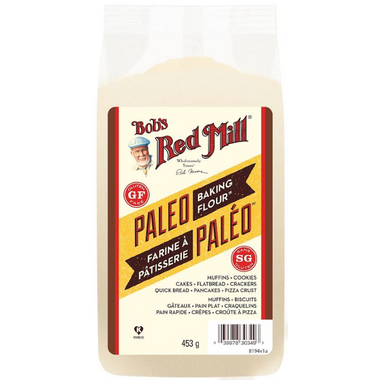 This "all purpose” Paleo Baking Flour is the ideal choice for flat breads, pizza crusts, crackers, cookies, muffins, cakes, pancakes, brownies and more. It also makes a great breading for meats and vegetables. Ingredients: Almond flour, Arrowroot starch, Organic Coconut flour, Tapioca flour. I need to get a bigger bag of this because it was perfect! I used it 1 for 1 in a blueberry muffin recipe and the texture was nice and fluffy unlike when I make recipes just using coconut or almond flour. I am trying to go "Paleo" and this product does the mixing of non-grains for me. The flavor is good too. My husband is gluten intolerant so this product is great for him too. I love this blend of flour. I use it in several recipes. Since I bought it the first time, I now always keep it on hand. Trying to avoid all grains and this flour seems to bake up like regular flour and has a great taste. Does not feel gritty as you might expect. I use this flour for making banana bread, muffins, crackers...pretty much anything and each thing has turned out great. We try to eat â€œcleanerâ€� so this flour is an excellent addition to my pantry!